This was my first time attending and I quite enjoyed the keynote speaker, Louis-Philippe Dalembert, a Haitian from France. He read excerpts from his last novel, Rue du Faubourg St-Denis. It's basically the story of an adolescent of Haitian descent living in France with his Haitian-born illiterate mother. In a now familiar narrative of the immigrant experience, he serves as her eyes, ears and crutch. He reads her letters sent by relatives in Haiti that inevitably end with requests for money. In his french urban slang, he expresses awe at this far-away place with bizarre customs that he barely understands but to which he is his mother's only link. After all, only he can read or write her letters. Tired of handling her money transfers, he ends up teaching her how to sign her name. An old French lady asks him if he is French and he says "Sometimes." He tries to make sense of his mother's religious customs by measuring them against the ambiant islam of those other immigrants who live in his neighborhood. Dalembert hopes that the novel will hopefully get readers thinking about issues dear to immigrants raising children in host countries, whether France, America or wherever. "How do you deal with identity problems?" he asks. 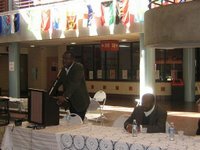 Other panelists included the editor of the Presses Nationales d'Haiti whose goal is to republish old out-of-print Haitian classics. He mentioned that books published by Haitians abroad are exceedingly hard to find in Haiti and that his press plans to republish those books for Haitian audiences. Other speakers included Frantz Voltaire, an editor and filmmaker from Montreal and Jean-Robert Leonidas, author of Les Campeches de Versailles. 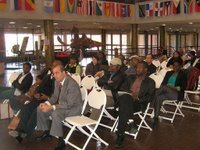 The conference was organized and the panel chaired by Jasmine Narcisse, French Professor and online haitian book store owner. You ask a good question when you wonder who will translate Haitian lit to Haitians-Americans who don't speak or read our national languages. More and more Haitian-American voices share their stories in English. 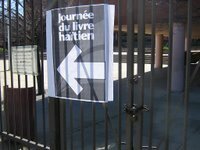 However Haitian authors have and will primarily write in French. Hopefully when things get better, The Haitian-American youth will be able to go more often to the Motherland and spend a semester or so at a Haitian university to perfect their French and Creole. We all can dream!